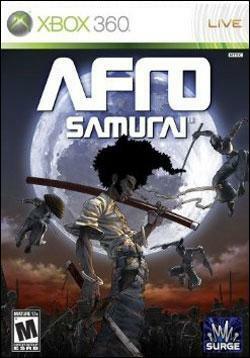 The original anime version of Afro Samurai provides the perfect formula for a video game. The premise: in its world, there are 2 headbands (#1 and #2), which are blood-lusted after by anyone who wants everyone to know of their god-like fighting skills. This creates a perfect hack-and-slash mentality: those without the #2 headband are always chasing after whoever wears it; the #2 simultaneously (and constantly) has to both defend his legacy as #2 while trying to dethrone #1; and the #1 sits pretty waiting for #2 to find him (while somehow not letting his skills dull  perhaps by taking on line-cutters). Like I said: the perfect formula for a hack-and-slash video game, especially when the player is cast as the #2. And even though hack-and-slash action button-mashers can get real tiresome real fast, when you take into account the tremendous storyline, voice acting, soundtrack, graphics, and even novelties such as “Body Part Poker,” you have one hell of a game in your hands that maintains interest for however long the batteries in your controller last. Graphics are definitely the pretty part of what keeps the average gameplay session to nothing less than hours. It’s pretty  real pretty. It’s not polished Ninja Gaiden-beautiful, but then again it isn’t meant to be. Its cell-shaded anime/manga blend makes the playing experience feel something like navigating a cut scene. At times, some of the techniques used can be frustrating or distracting, but it all works in the end to create a totally immersive environment. It’s what makes this video game become the hybrid movie/game it is intended to be. Afro Samurai employs a very unique HUD. Usually such a thing would clutter the game screen with such non-prettiness as scores, life meters, and maps, but here it doesn’t even appear as part of the game. Who cares about score, anyway? The point of this game, which stays mostly faithful to the anime (and only excels at diverting from it), is to take on anyone in your way on your path to the #1... in the name of vengeance... in the name of your father. So, instead of distracting from the story’s catharsis by cluttering the screen with obvious game-oriented indicators, the HUD turns Afro’s clothing into the life meter, becoming more or less bloodied as his health decreases or increases, respectively. Another stroke of brilliance is the casting of Afro's imaginary partner, Ninja-Ninja, as a GPS/where-the-hell-do-I-go-now system, who spontaneously appears as a puff of smoke calling to you from the general direction in which you need to head (and waits patiently until you find him) during the more maze-oriented phases of the game. Aside from the non-reversible horizontal camera control that is annoyingly opposite of most action games, fight scenes are superb. Even the most basic enemies will take advantage of a turned back and are agile enough to give Afro a run for his sanity. Instead of tutorials, players learn techniques via select boss battles and memento collection. Getting combos aren’t all that crucial, though...just fun, so don’t worry if you’re not a Dead Or Alive master. Another aspect of gameplay that helps in executing some of the more complex moves is "Focus Mode," which lets the player slow down time enough to concentrate on which enemies to slash first and aim for select body parts (and even time mid-air slashes). That's not to say the action is always slow-able or so simple that fights become boring, but Focus Mode helps keep everything manageable. A mix of cut scenes as well as watered-down Prince of Persia-esque puzzles and mazes help to break up what might otherwise become monotonous button mashing. Overall, this is a great example of how an anime should be adapted for interactivity. Its blend of great graphics, non-stop action, and enthralling story is simultaneously immersive and awe-inspiring.